— How’s Daniel’s curl book going? I can hear absolutely nobody asking. I’ll just go ahead and tell you anyway since I had a plan to get a first version “done” by “the summer” (of 2016). I’m not sure I believe in that time frame anymore. I’m now north of 40,000 words with a bunch of new chapters and sections added recently and I’m now generating an index that looks okay. The PDF version is exactly 200 pages now. The index part is mainly interesting since the platform I use to write the book on, gitbook.com, doesn’t offer any index functionality of its own so I had to hack one up and add. That’s just one additional beauty of having the book made entirely in markdown. On this page you can get the latest book stats, right off the git repo. Thanks for the positiveness, Terry! I need this pdf ! Heard this book from Terry on Twitter and download the EPUB version from GitBook. 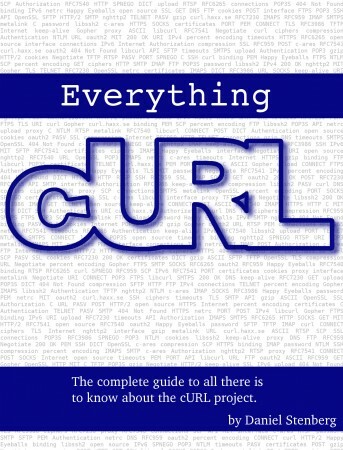 I am new to cURL, this book helps a lot. Thank you for your great work, Daniel! Have you encountered any page in the book so far where you couldn’t express what you wanted in markdown or where you had to work around your text/code a bit so it worked with markdown? It looks like they have GitHub flavored markdown so you can do tables and other things. No, I think markdown has worked really well for the contents and so far I’ve not felt restricted by that format. The biggest restrictions I felt was the lack of index support, but I feel that my own approach to tucking that on is working good enough to compensate. I even use tables at a few places and I should probably use them even more.